Population genetics and ecology have been modeling biological systems quantitatively for over 8 decades and their results have contributed greatly to our understanding of the natural world and its evolution. Theories in these areas necessarily had to focus on comparisons of the contribution of different individuals to changes in the bigger picture at the expense of ignoring much of the complexity that exists inside individuals. Current systems biology provides new insights into this complexity within organisms. 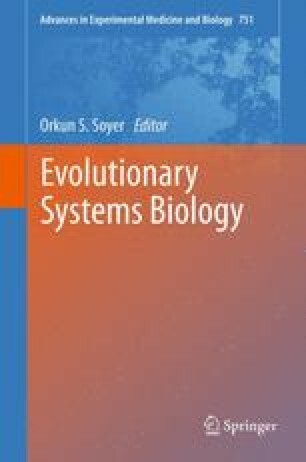 Here I review developments in evolutionary systems biology that have the potential to lead to a more unified approach that integrates contributions from current systems biology and population genetics. Central integrative concepts in this approach are the adaptive landscape and distributions of mutational effects. Both capture our understanding of the fitness of individuals and how it can change. Fitness is frequently used in population genetics to summarize key properties of individuals. Such properties emerge from the complexity of molecular processes within individuals, often in interaction with the environment. The general principles of this approach are reviewed here. This work can open up new avenues for computing critical quantities for models of long-term evolution, including epistasis, the distribution of deleterious mutational effects, and the frequency of adaptive mutations. I thank the editor and two anonymous reviewers for helpful comments on this manuscript and the Wisconsin Institute for Discovery at the University of Wisconsin-Madison for support.